If you remove all users from a pack, your Method account will no longer be charged for that pack. This is how you remove a pack from your Method account. In this article, we will go through the process of removing a pack if you are still in your trial Method account, and if you are a subscribed user. 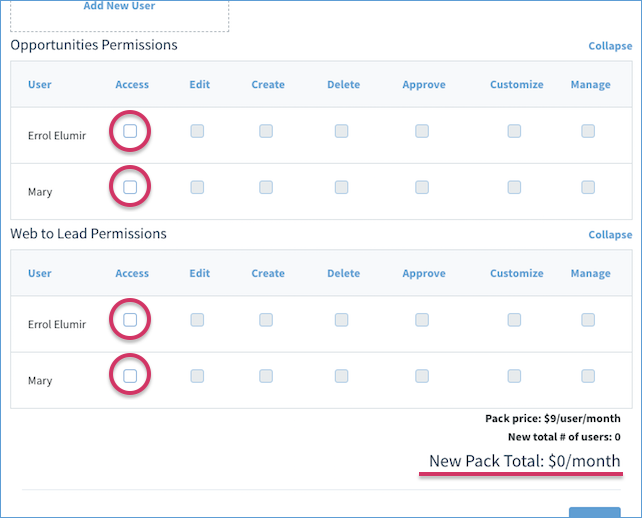 Note: Only users with administrative permissions can add and remove packs. Please see Managing user permissions for more information on administrative access. 1. At the top of the screen, click the Subscribe. 2. 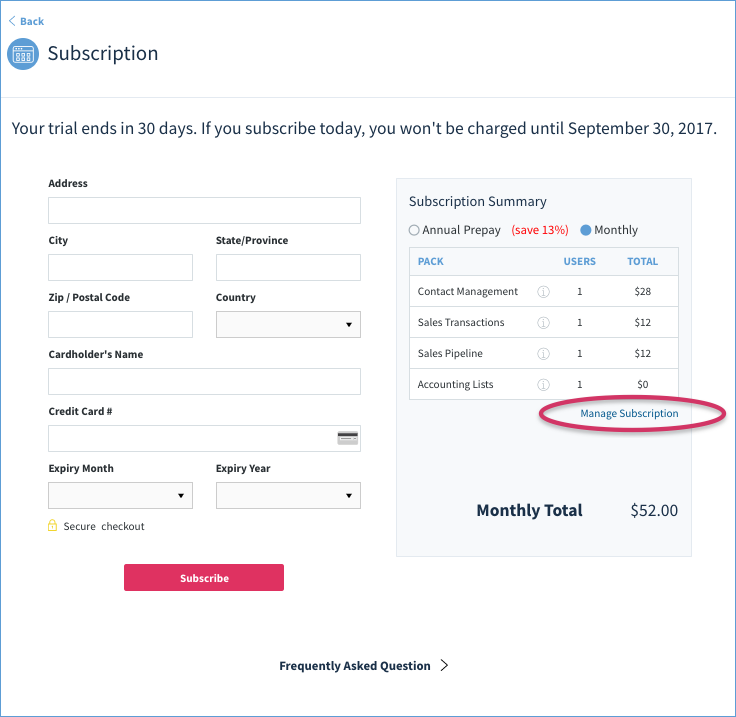 This will open up your subscription billing screen. 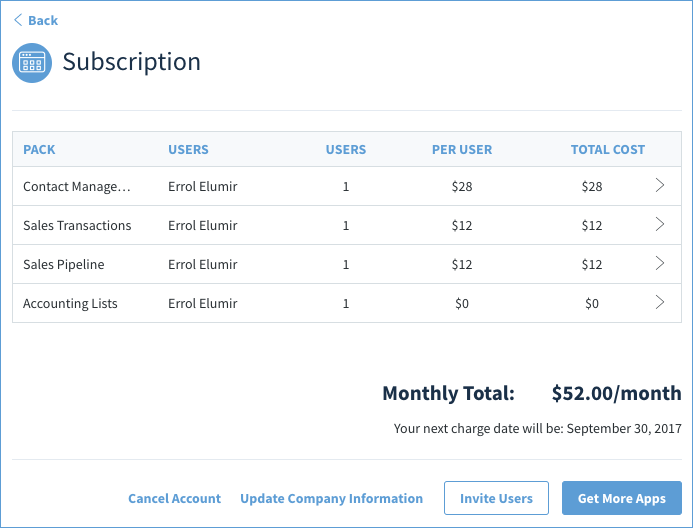 Within Subscription Summary, find the Manage Subscription link and select it. 3. The next screen shows your installed packs and how many users you have for each. To remove access, select the desired pack in the list. 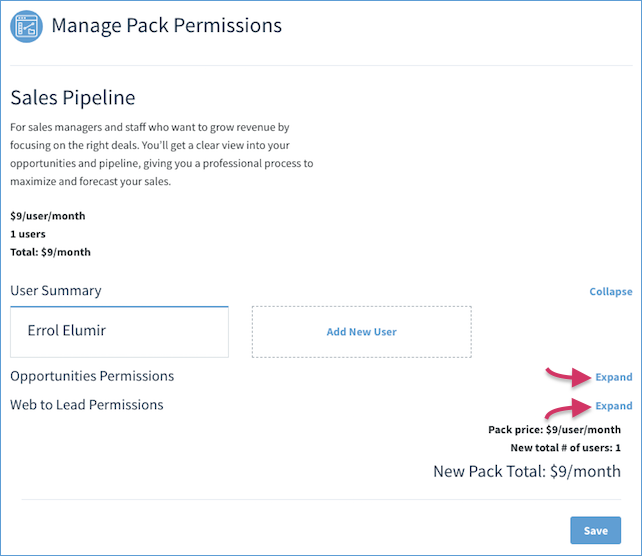 In this example, we will select the Sales Pipeline pack and remove it from our subscription list. 4. This opens the Permissions screen for that pack: You will need to expand each app to see the users. 5. As mentioned before, you need to remove access for all users in every app of the pack to unsubscribe from the app. In this example, all users have been removed from the Opportunities app and the Web to Lead app. Note the Pack Total is $0/month. Note: Even though unsubscribed, the pack will still appear on your Subscriptions page, but with 0 users and a total cost of $0. You can always add users to this pack to subscribe to it again. Unsubscribing to packs and apps are similar to above, except for how to get to the Subscription List screen. 1. At the top right of the screen, select the Gear and then select Subscription. 2. Continue with step 3 above as if you had a trial account.